Americans use the word “hoist” for the device that the British and Russians call “lift”. But no matter what it is called, this is basically a hoist – something that raises us from the ground, and we, like Antaeus, having temporarily lost our footing, lose our strength. 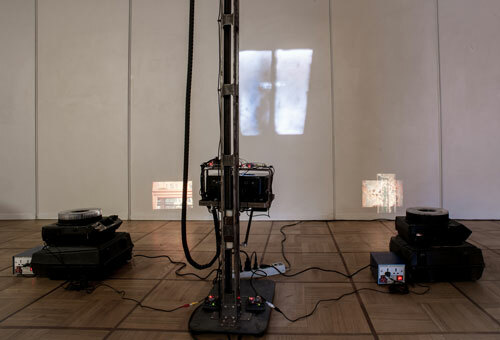 In this installation, the video projector, which is moving with rasping noises on a rail and projecting the video of an hoist shaft on the wall, reminds us of that anxiety. However we see the slides that a couple of old Kodak projectors show at our foot level, and these impressions keep us firmly on the ground.